Trigger and Roy Rogers, date unknown. After a childhood on the farm, Roy Rogers became a musician, then movie star. He became the most popular singing cowboy of the World War II era. Moving to radio and television during the Baby Boom, be became even more popular. The Slye Family were fairly struggling, moving from the slums of Cincinnati to a houseboat on the Ohio River. A flood landed the houseboat, then they purchased a farm, where the young Len learned the basiscs of horsemanship. For entertainment, Len learned to play instruments and to sing and yodel — along with his mother, Mattie. Len Slye wanted to help the family make ends meet, and so took a job alongside his father Andy in a shoe factory. He dropped out of high school. Sister Mary got married and moved to Lawndale, California, having the family visit in 1929. They liked it so much, that they moved permanently, with Andy finding work in a construction company. But that did not last long, and Len lit out for Tulare, California, where he became a peach picker. Returning to Lawndale, sister Mary got Len to audition for a country radio program based at a local radio station. Overcoming his shyness, Len got a slot with the Rocky Mountaineers in August, 1931. Many musical combinations later, the Sons of the Pioneers were formed in 1934. The Pioneers were very popular across the country; in August, 1934, they signed a recording contract with Decca Records, and had their first hit with "Tumbling Tumbleweeds" written by bass player Bob Nolan. The Sons of the Pioneers recorded many classics for Decca, including "Cool Water," also written by Nolan. The Sons of the Pioneers appeared in several features and shorts, beginning with Slightly Static (released in September, 1935), for Hal Roach. Meanwhile, singing cowboy star Gene Autry was very busy crankin' 'em out for Republic Pictures. 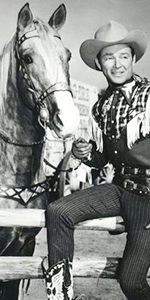 Now named Roy Rogers, the new kid at Republic appreaded in some of Autry's films, such as, The Big Show (released in November, 1936), and The Old Corral (released in December, 1936). Rogers married Dale Evans in 1936. The story goes that Autry began to demand more money for doing films, so Republic held a contest to see who could replace him: Rogers won, starring in his first solo show, Under Western Stars (released in April, 1938). 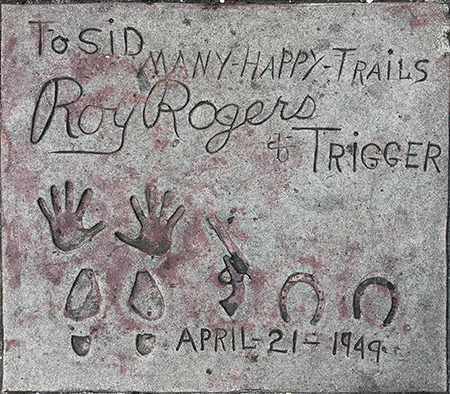 He got to play the title character in Billy the Kid Returns (released in September, 1938), but like Autry, Rogers' character he played in many of his films was his own: Roy Rogers. Rogers was actor enough to also want to play other characters, such as in Dark Command with John Wayne (released in April, 1940). Rogers needed a horse for his films, and chose "movie horse" Golden Cloud, who had carried Olivia de Havilland through The Adventures of Robin Hood (released in May, 1938). The Palomino had been working in films for some time for the Hudkins Rental Stable in Hollywood; Republic rented the horse until Rogers bought him in 1943 for $2,500. Re-named Trigger due to his quick reactions and intelligence, Trigger made many personal appearances with Rogers. At Republic, Rogers starred in a staggering number of films: eight in 1941, eight in 1942, five in 1943, nine in 1944, and six in 1945. Rogers sat atop the Motion Picture Herald and Box Office magazine's western stars poll from 1943 to 1952. His films were in the top ten money makers for 1945 and 1946. Many of his films were in color, and Rogers won the right to market his name and likeness, allowing many mechandising opportunities. Some notable Rogers films include: Robin Hood of the Pecos (released in January, 1941), King of the Cowboys (released in April, 1943), Cowboy and the Senorita (released in May, 1944), Don't Fence Me In (released in October, 1945), and The Golden Stallion (released in November, 1949). Rogers made Son of Paleface (released in July, 1952), for Paramount and director Frank Tashlin. In 1944, Roy Rogers and Dale Evans took to the airwaves with The Roy Rogers Show over NBC. Wife Dale had written the show's theme song, "Happy Trails." The radio show was tranferred to television in late 1951, and running until 1957. After that, The Roy Rogers Dale Evans Show was broadcast on ABC in late 1962. These shows television were in re-runs for many years. Rogers also produced the western television program Brave Eagle on CBS in 1955-56. Rogers did a cameo in the Bob Hope picture Alias Jesse James (released in March, 1959). In their semi-retirement, Rogers and Evans were active in groups which led to the founding of Bel Air Church, and were very involved with children's charities. His last film was a picture called Mackintosh and T.J. (released in February, 1976). After owning a huge ranch in Chatsworth, Rogers moved the whole shootin' match to Apple Valley. Trigger died in 1965. Rogers died of congestive heart failure in 1998. He was 86. Grauman's Chinese Theatre, Hollywood, California. 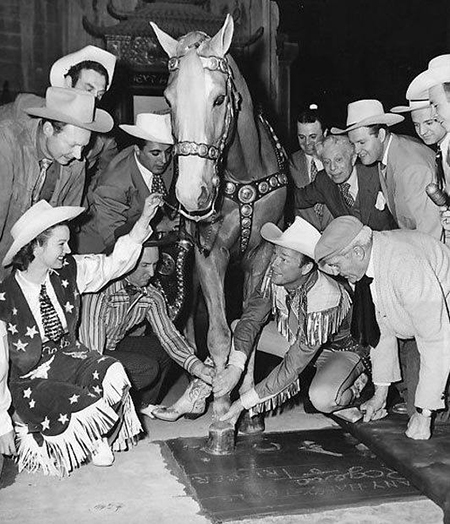 Roy Rogers and Trigger Forecourt ceremony, Thursday, April 21, 1949. Dale Evans (kneeling on left) holds Trigger's bridle while Roy Rogers places Trigger's hoof into the cement as (kneeling at right) cement artist Jean Klossner looks on. Sid Grauman is seen peering over Roy's shoulder. Pat Brady is standing behind Dale Evans.